Purchasing a Bad Axe saw delivers to you a tool that is well-made, and incredibly sharp. But that goes without saying, or why purchase any quality saw to begin with? So I believe I owe you an explanation as to why a Bad Axe saw is different from other companies. I could go on and on about the details, but at the end of the day what makes Bad Axe different is that you have choice in design where form and function converge: choice in plate gauge, wood species, pitch, finish, and fastener design. This kind of choice enables you to customize the saw in accordance with your individual taste and and cutting requirements. That's pretty much about it. Otherwise, a saw is a saw is a saw. But there is one other difference, and that is my reputation as a sawfiler. 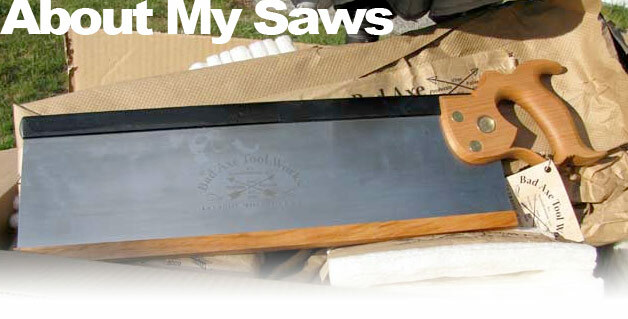 My saws are only as good as the last one I built and sharpened. The industry plays host to some outstanding sawmakers: Pete Taran. Mike Wenzloff. Thomas Lie-Nielsen. Eddie Sirotich. Joel Moskowitz. Ed Paik. Andrew Lunn. . . 'Made in the USA' used to mean something back in the day, and these men have put credibility back into the credo, while other U.S. manufacturers have fallen asleep at the switch. I salute these fine tool makers from both the U.S. and Canada, who have revitalized the ethos of unparalleled American craftsmanship and pride in product—they have my deepest respect. So I invite you to purchase a Bad Axe! After placing your down payment, I will send you a confirmation email thank you for your order, and asking you to respond in kind by describing what species of wood and dimensions you typically work. I will be very happy to file your saw with the best rake angle, fleam and gullet appropriate to your work. Many thanks for your interest in Bad Axe saws. May the saws I build for you find a home in your great-grandchildren's workshops in the 22nd century.